Abdesslem Trimech, a Tunisian street vendor, set himself on fire in the provincial town of Monastir to protest the government. That was March 3, 2010. Trimech died, mourned no doubt by his family, but otherwise obscure and inconsequential. On December 17, Mohamed Bouazizi, a Tunisian street vendor, set himself on fire in the provincial town of Sidi Bouzid to protest the government. 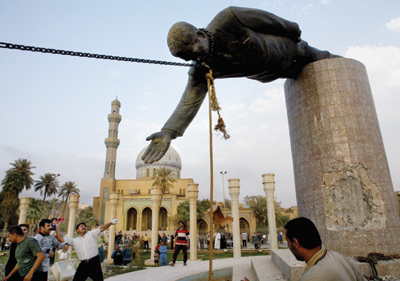 His suicide ignited a popular uprising which within weeks had overthrown the authoritarian Ben Ali regime, and spilled over into Egypt, Libya, Bahrain, Yemen, Iraq – virtually every corner of the Arabic-speaking Middle East. Can we identify a reason for the diametrically different effects of these two very similar deaths? I don’t believe complex events can be reduced to single causes, but in the cases of Trimach and Bouazizi a significant difference leaps out. 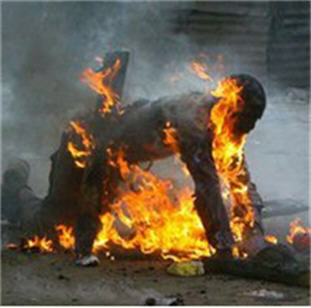 Bouazizi burned to death in front of a camera. For as long as digital images hold true, we will watch him explode into flames, still walking, at a nondescript public square. This image is impossible to absorb without feeling pain and horror. Without words, seemingly untainted by special pleading, it tells the story of a man driven by his rulers beyond the last measure of despair. 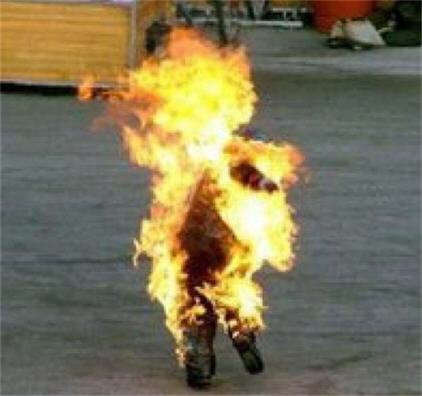 The photos of Bouazizi’s self-immolation were posted on Facebook, and aroused powerful emotions in and out of Tunisia. He was converted into a cause, in both senses of the word. In contrast, the unphotographed Trimach died a faceless shadow. I won’t beat around the bush: images, both still and video, set the public agenda today more effectively than text. 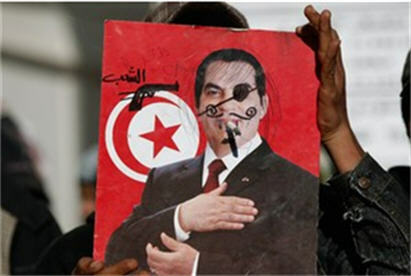 This was certainly the case in Tunisia, and in the other countries swept up by the Arab uprising – an upheaval which has rattled establishments and toppled thrones, but has remained, so far, remarkably free of ideological debate. Images are more potent today because there are so many more of them: inherently, they were always more persuasive. Numbers seem to defy the laws of physics. YouTube uploaded 24 hours of video every minute (March 2010). The YouTube audience has exceeded 2 billion views per day (May). Nobody knows the number of still images posted online, but here’s an indicator: every month, Facebook alone uploaded 3 billion photos (February 2010). Because we are skilled at using textual “rhetoric” to influence teach­ers, employers, and customers, we are rightly suspicious when it is aimed at us. With visual media, however, the illusion is created that we are gazing out of a window at the real world. . .
To the proliferation of image producers and consumers, then, we have to add two compelling facts that define and complicate the transformed glob­al information environment. Visual material is felt far more viscerally than text, and human beings are far less skilled at guarding their judgment against this style of persuasion. One implication is that communicators gifted in the use of visual rhetoric will thus exert enormous influence over target audienc­es. While some members of the new generation of visual persuaders wish to move audiences to do nothing more than buy one brand of soap over anoth­er, others seek to promote causes and ideologies which reject democracy and the rule of law while glorifying violence, crime, and other sinister pursuits. Video is selected and presented to an audience by a specific originator for a specific purpose. Technique is meaningful. Images from hand-held devices, for example, appear unpolished and thus authentic, while slick Madmen-type presentations arouse skepticism and distrust. The visual record of the great Arab uprising of 2011 originated almost entirely with the protesters, and consisted of an unprecedented fusion of cell phone images with satellite TV. (According to this article, 60 percent of Al Jazeera’s video during the Tunisian uprising came from cell phones.) As is often the case, the young rebels defined themselves visually, while their governments, run by men of a certain age, issued reams of textual pronouncements, policies, and threats. To be effective, visual persuasion must grab attention. It requires drama and conflict. From the first, the upheavals in the Middle East were framed as a struggle between the people and their autocratic rulers. Crowds of demonstrators – never more than a tiny fraction of the population – embodied the people. 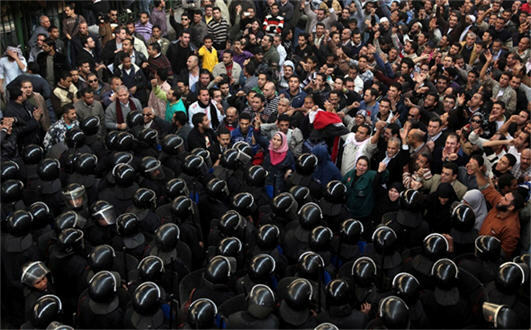 Repressive forces – police, military, goon squads – played the role of the regime for the cameras. For the protesters, this visual argument was impossible to lose. 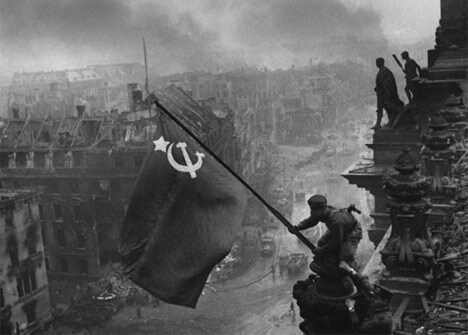 With the crowd cast as hero, the machinery of visual rhetoric was brought to bear on the conflict. Like language, images contain a surprisingly limited number of rhetorical possibilities, most of which have been worn by repetition and are of long pedigree. The effect on an audience can range from the emotion of the sacred to a cliché-induced yawn, depending on the skill of the originator. 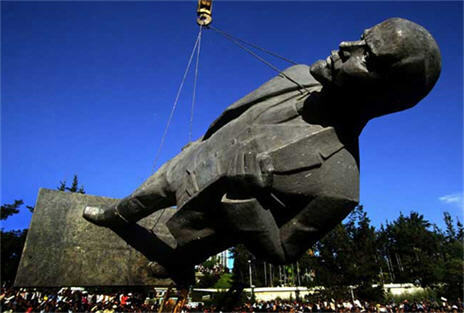 A perennial device to signify the fall of a regime is the obliteration of the ruler’s physical image. 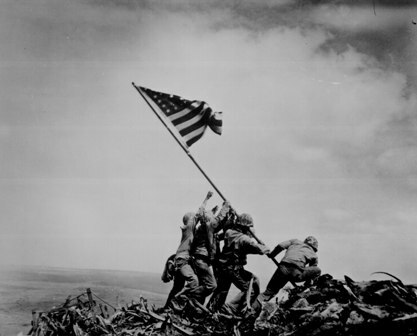 Another predictable image is the victorious raising of the flag. 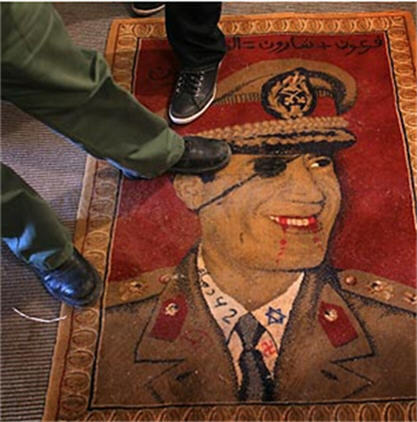 Usually this refers to a military triumph, but in Cairo’s Tahrir Square it becomes an exuberant identification of the heroic crowd with the nation – and visual refutation of the autocrat’s claim that he, alone, personifies national dignity. Because media played a part in the drama second only to that of the crowd, some of the visuals in the Arab uprising have been unique – or at least new to me. My question about the photos below isn’t really about authenticity, but about spontaneity: were they searched for, or stumbled upon? By participating in the events which they communicated, Al Jazeera and YouTube, and to a lesser extent the other satellite and cable newscasters, gave the primacy to video over still images in portraying the drama of the uprising. This was a restless revolution, not a series of frozen moments. The video came in two modes, both of which helped establish the nearness and protagonism of the crowd, and emphasized the otherness and inhumanity of the forces of repression. One mode was cell phone video. Basically the crowd’s eye-view, this format transformed the global audience into an Egyptian or Libyan protester, sweeping it onward, unsteadily, amid defiant chants, shrieks of terror, howls of pain. Regime violence appeared as a blurred threat in the middle distance. Cell phone material was re-broadcast by TV news, but its natural habitat is YouTube, where a Darwinian competition for attention winnowed out all but the most compelling. Battles, killings, celebrations – short, highly theatrical scenes, each showing the perils of the crowd, its suffering and triumphs in the unequal struggle against repression. The second mode, streaming video, pertains largely to Al Jazeera, and was the opposite of theatrical. Most of it was boring. Rarely does anything exciting happen in front of live news cameras; this was no exception. By its very dullness, streaming video emphasized the institutional permanence of the crowd. The crowd was always there. Its endurance, by itself, had a dramatic quality, even when nothing was happening. The regime had surrounded and attacked it, because the regime wanted the crowd gone. 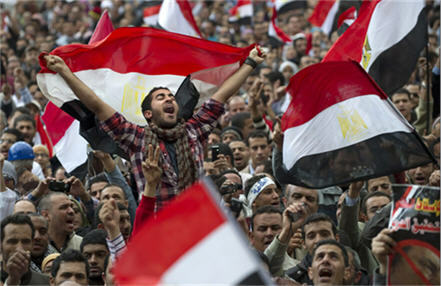 Streaming video showed the world that the crowd, hero of the uprising, would not be pushed offstage. 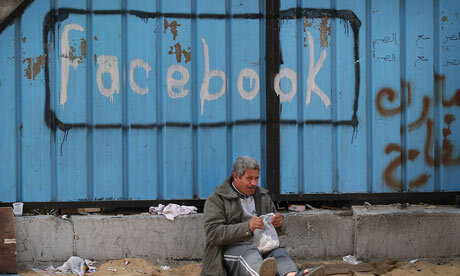 This turned out to be of crucial importance in Egypt, less so in other countries. 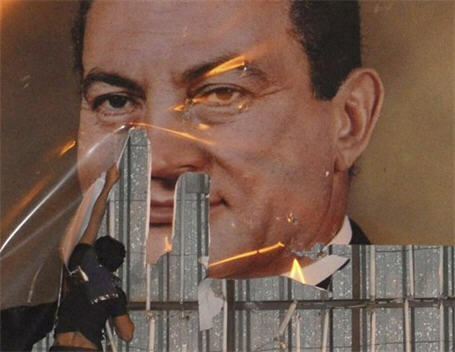 In fact, as protests and violence spread across the Middle East after the semi-implosion of the Mubarak regime, the images, like the news itself, lost their initial focus, their ability to set the information agenda. That at least is my current take, subject to future research and revision. This entry was posted in visual persuasion. Bookmark the permalink.